This performance was at the Casino de Paris, a professional venue for theatre, concerts and one-man shows. It was very exciting to be on the huge stage knowing so many successful artists had starred on these planks before us. Here I am dancing with Desita’s troupe, including my artist friend Lydia Khripouchine. With this dance form we feel ourselves graced with delicacy, femininity and serenity. It’s enchanting. Though it was a marvellous moment for us, suspended in time, things are not eternal. Danii, the dancer with the long blond hair has since died from food poisoning that she got on holiday in India. She is greatly missed. 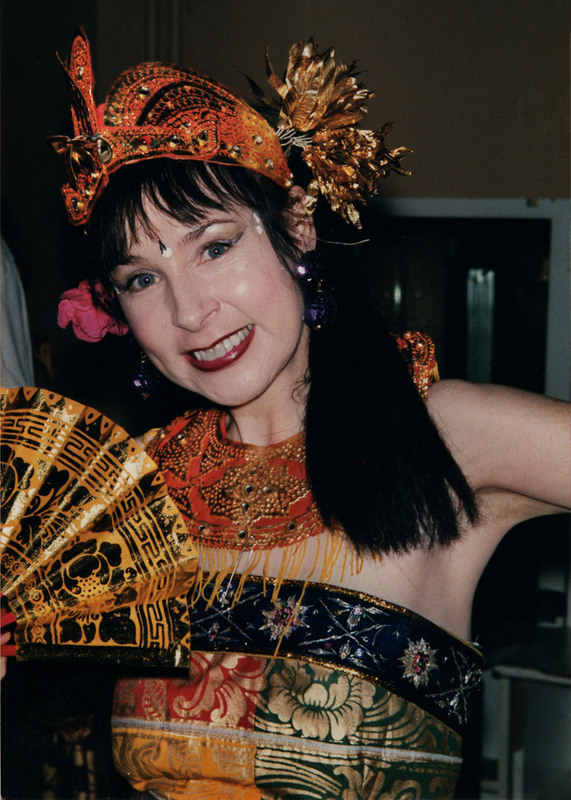 Maria D’Arcy in costume at the Théâtre de Mogador June 2001. My first muse was watching dancers in veils, blowing in the wind on an Arabian desert, that is to say on television—so I felt exalted when very gradually I was able to dance The Seven Veils (on stage), to follow the rhythm of percussions and snake my body to the sound of the “oud”. Yet something was missing—I felt I wasn’t quite reaching the sensuality of Oriental music. I wanted to use my hands more fluidly. I signed up for ten Flamenco classes but the teacher focussed on the complexities of feet. So next I tried Indian dancing but after eight weeks of tapping out rhythms I didn’t feel motivated to get out of bed so early on a Saturday morning. The enthusiasm and clarity of the teacher can make or break a class. I kept seeking and then, Hooray! I discovered Desita (at the Centre de la Dance in the Marais) and her exquisitely graceful Balinese dancing. Rather new to Paris at the time, often I confused dance jargon with basic French vocabulary. For a long time I understood «coude» (elbows) to be an arm position! Desita was proud of her disciples and arranged for us to dance at Parc de La Villette, at the summit of Montmarte, the Balinese Embassy, Théâtre de Mogador and several suburban community centres. I remember well the festival in the grounds of the ancient church of Saint-Pierre, just beside Basilique Sacré-Cœur; it was a hot, sunny day in July, the stage was black and when we barefoot dancers glided onto the stage we felt we were moving on hot stones. We started exchanging furtive, desperate looks until someone took the initiative and threw cold water on the floor. Take 2. Part of the joy of performance was the elaborate dressing up ritual. It was Desita who provided all the costumes, sashes, flowers, crowns, while we exchanged costume jewellery and everything else that glittered. We encouraged each other to sweep on more and more make-up and the results in the mirror tickled us pink—we liked to think we resembled Indonesian goddesses. All images, video and text are © 2018, Maria D’Arcy, all rights reserved. Written permission is required for any use.